IOCL is energy major and the highest ranked Indian company in the Fortune’s prestigious Global 500 list. Through last five decades of relentless service to the nation, we have emerged as the largest business enterprise in India with a turnover of Rs 4.57 lakh crore (US$ 75.67 billion). We operate one of the Asia’s largest networks of Refineries, Pipelines, Marketing and Petrochemicals business. Empowered with ‘Maharatna’ status, we are nurturing our vision to emerge as ‘The Energy of India’. OBC (Non Creamy Layer) / SC/ST / PWD candidates : Age relaxation as per the Presidential Directives. (1) First fill online application for GATE- 2019 examination. (2) Second fill IOCL online application with GATE-2019 registration number. Application Fee : No Fee. (1) The candidates will be shortlisted on the basis of GATE-2019 score. (2) The final selection will be done after Group Discussion (GD) & Group Task (GT) and Personal Interviews (PI). 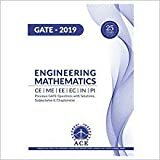 I am final year undergraduate student pursuing BTech in Engineering Physics.Am I allowed to apply for ONGC through GATE score in physics stream?? ONGC advertisement asks for MSc Physics. PS. 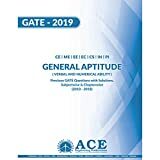 GATE physics paper can only be given by BTech in Engineering Physics/Msc in physics. So I assume examining authorities consider BTech and MSc equivalent for eligibility to give GATE.Do PSUs consider MSc in Physics and BTech in Engineering Physics equivalent? May be they consider B Tech in Engineering Physics equivalent to M Sc in Physics. But by checking official ONGC notification you will find that they didn’t mentioned B Tech in Engineering Physics as education qualification in any post column. By checking ONGC notification you will find that ONGC specified required education qualification against each post specifically. So, We would not suggest you to consider this combination correct. If you still have any query please file an RTI against ONGC to get required information. Hlw sir…… i have just completed my 2nd year mechanical engg. And wish to join IOCL. I want to know about how much extra circular activities matters…?? I have also from deemed college ….. so how resources i can use to this. Nowadays IOCL recruit through GATE exam. So you must first target to achieve good rank in GATE then extra circular activities. Because if you fail to achieve good rank in GATE you would even not listed for interview call. does iocl have vacancys similar to that in 2015 for chemical??????? i am not able to print my iocl application form .. i hav registered myself sucessfully i hav my reg no too . but when i try to login to take the printout it says object moved . altough the application form was opening till 14th of feb . is that a problamatic situtation for me? hello sir, My qualifying degree is M.Sc in Computer Science and I have given GATE 2016 , am I eligible for IOCL application? Hello sir…please tell me if i crack the gate score and having lesaer %of 65%…may i eligible for this job? I’m from Electronics and communication stream, can I apply for IOCL through gate 2016? sir …i am going to give GATE-16 exam in the stream of electrical..but i can not undestand that when will the medical certificate and fitness details be required..i mean is it required during online application process of IOCL..or after selection of IOCL as per the GATE16 result? I am industrial and production egg. student and I applied for gate 2016 from PI branch. Is I am eligible to fill the registration form of IOCL ? I am doing my Msc. in Chemistry and i will write gate 2016 for chemistry. Is there any job opportunites for chemistry graduates. and campus visit of IOCL this year will be held or not? am not able to find application form on IOCL website.firstly i click on link->careers->latest opening But i am not able to find form that i want to fill plz help me lest date will gone…??? How should i apply for IOCL registration? Explain the whole process because in the given website i am not getting that clearly. Hello sir….i am instrumentation & control engineering student. can i apply for IOCL? May I know how many vacancies are there for polymer technology officers for gate 2016 ?? The age requirement for engineering discipline is 26 years. Is it the minimum age or the maximum? hey please help me , Actually I am from Plastics and Polymer branch from bit mesra. Can you suggest me that whether the company like ONGC Iocl recruits the polymer engineer through Gate -XE . As XE includes total 7 sections in which we have to select only TWO SECTIONS , As I am from Polymer branch and If I would select thermodynamics and fluid mechanics rather than selecting Polymer Science as a section in Gate -XE Paper than would i get a call for an interview in any PSU recruiting through Gate-XE after getting a good rank??? In XE jobs are offered according to branch -or- the subject (selected section)-or-all the students giving gate in XE gets the same preference in PSU??? OR Should I give MY gate exam in Chemical rather than giving it in XE to pursue a job in a PSU?? First, If you will change your branch for GATE paper then most of the PSUs will not accept you. For complete details about which PSU recruit which stream out of 7 through GATE-XE, You need to file an RTI to the company which recruit. Only they can answer your query better. So sir plz tell me in which subject should i give my gate paper to get best opportunity for the Psu jobs , as i am from polymer branch…???? plz suggest me asap!!!! There are very-very less PSUs which recruit for polymer branch. You need to check all PSUs details which recruit through GATE and collect name of all PSUs which recruit polymer branch engineering graduate. If you are not sure about their recruitment process or anything. just file an RTI to know your query against that PSU. Is IOCL considering Petroleum Engg students through gate 2016 (as petroleum Engg course has been introduced in GATE this year) ? 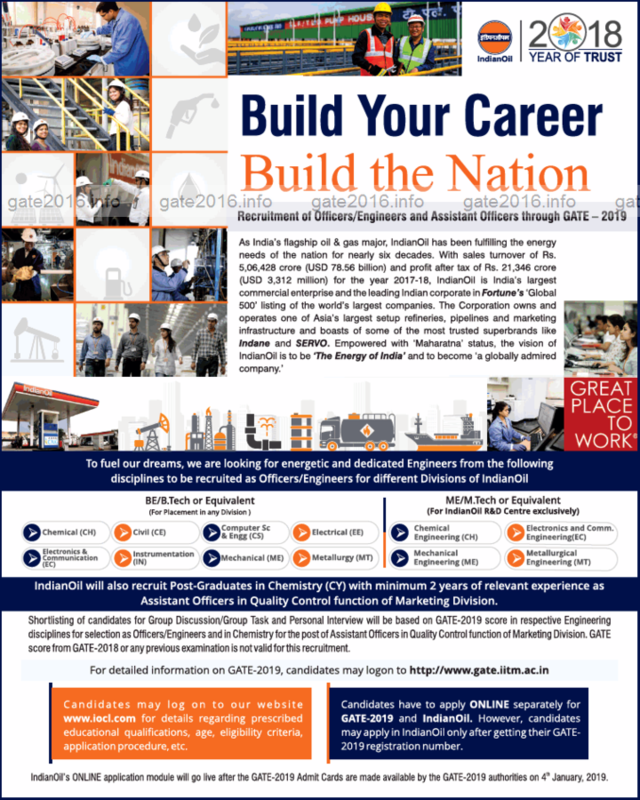 Yes IOCL recruiting Petroleum engineers through GATE 2016. IOCL through GATE 2016 short notice has come but full length notification is yet to come. I have done Btech in plastic & polymer.Can i eligible for IOCL ? which is preferable a job in PSU or Mtech after a good gate score? i want to know how much is the minimum gate marks to get public sector job? i am pursuing fourth year in electrical engg. GATE Marks vary year by year because it’s depends upon level of GATE paper. So, here we mainly consider GATE score. On the basis of GATE score we listed some PSUs and their Cut-offs. Is there any job opportunities for MSc graduates in physics in IOCL? Currently there is no job opportunity in IOCL for M Sc graduates in physics. Whenever it would be available we would notify on this page. You please be regular. You can try for ONGC though if you are eligible. They allow Msc degree in various disciplines. I am doing 3rd year Mechanical Engineering.Will I apply the GATE 2016 exam? No you can’t apply for GATE 2016 as per GATE 2015 information brochure. (1) Eligibility Criteria for GATE 2015 is : Currently in the 4th year or already completed. Note : There is written that : Year of qualification cannot be later than 2015. In your case it would be 2016 for GATE 2016 candidates. If you would clear your B.E./B.Tech. course in the year 2016 then you are eligible. (2) GATE 2015 score is valid for THREE YEARS from the date of announcement of the results. #All the above information are provided from GATE 2015 information brochure. It may change for GATE 2016 exam. Final decision is totally depend upon GATE 2016 organizing committee. hi sir, i wrote gate 2015 and got 37 mark and qualified in gate 2015.. but i didnt apply for IOCL last time…can i apply this time…..because gate score s valid for three years..can i apply IOCL 2016 through gate 2015? PSUs generally allow recent GATE score for their recent recruitment so that they can provide equal competition level to all applicants. so my gate score will not be accepted ah sir? am i want to write again 2016 also?